I built a six pack the other day at the local ABC Fine Wine and Spirits store. I wanted to get a few different porters and stouts for the wife to try. 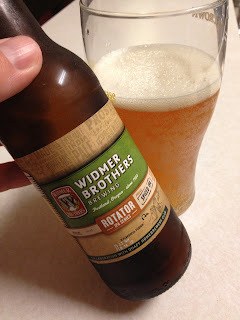 The pack wouldn't be complete though without an IPA for me.So, I added the Widmer Brothers Rotator Falconer IPA, or so I thought. I opened it, poured it, took a photo and tried it. I then noticed the label said Spiced IPA, and nowhere had mention of Falconer... Ugh, I bought the wrong thing. This beer is very yellow in color, almost pee yellow. The nose is that of lavender soap. It tastes flowery, with a finish that makes you wonder if it was brewed with the left over water from the flower bouquet used at my grandmothers funeral. Brewed with "malty assam black tea, ginger, cinnamon, clove, star anise, black pepper, and cardamom," this beer is like spice factory accident. If you like spices, this may be the beer for you. It's a cacophony of flavors for sure, with the spices dominate...way dominate. Perhaps I'm just not big on the overuse of spices, or perhaps this just wasn't what I expected... but I'm not yet a fan.